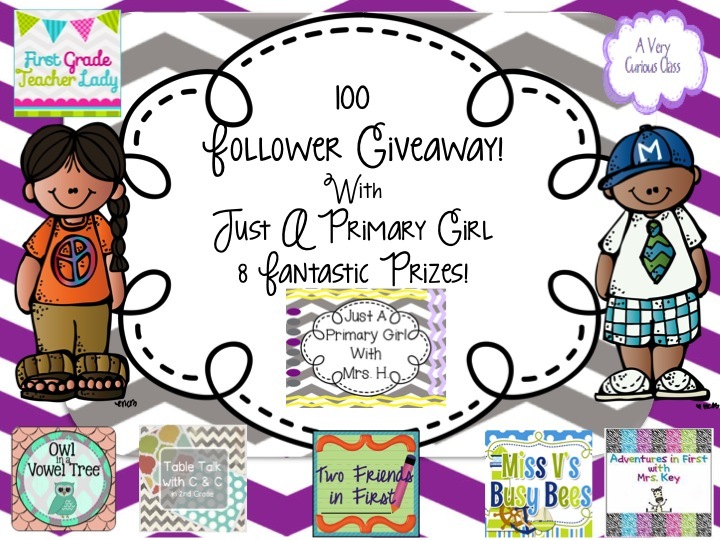 I am SO excited to have a 100 follower giveaway. I really didn't think anyone cared about things I made or had to say, but I guess 93 of you care! Thank you for that! :) I hope that my tutorials and freebies have been helpful in creating home goods and to use in your classroom! I am teaming up with some fantastic ladies to have a great giveaway. Each of my bloggy friends will give you one item from their TPT store! That is 8 fantastic prizes! The details are below! Follow each of our blogs, TPT accounts, instagrams and facebooks. Then leave a comment for what you did! :) The giveaway ends on Tuesday next week at midnight! I don't use Instagram, but I followed the rest of the links!! Congratulations on your followers!! Congratulations! I followed all of the links except Instagram (I do not have Instagram). Your blog is wonderful and I love reading all of things you share. Woohoo! I pinned your giveaway too! I also pinned your giveaway on Pinterest so hopefully lots of other pinners will check it out. Hi there, I followed all the links...however, I am not sure Table Talk with C and C's link for instagram. I am not that familiar with Instagram, but I didn't see where I need to click to follow. Can you check that for me and let me know? Hi! I've followed all the links (I did have the same problem with the instrgram link for C and C's as Mrs. Brown ^. . . I think I follow her anyway ;) Thanks for offering such a great giveaway! Thank you for following! :) So happy you are here! Thank you for pinning, and following all of us! Good Luck with the giveaway! I love all your ideas! Thank you for all the great links. I also shared on Pinterest. I followed all the blogs, TpT stores and instagram pages! Hope I win! Thank you! HI! I love your blog! I just nominated you for the Liebster Award! Congrats! Thank you for this awesome giveaway!! I've followed everyones' blog, TPT account, and Instagram! I'm your newest follower and newest member to the blogging world! Congratulations on your 100 followers! Please stop by and check out my new blog: itsacorething.blogspot.com! Thank you so much!